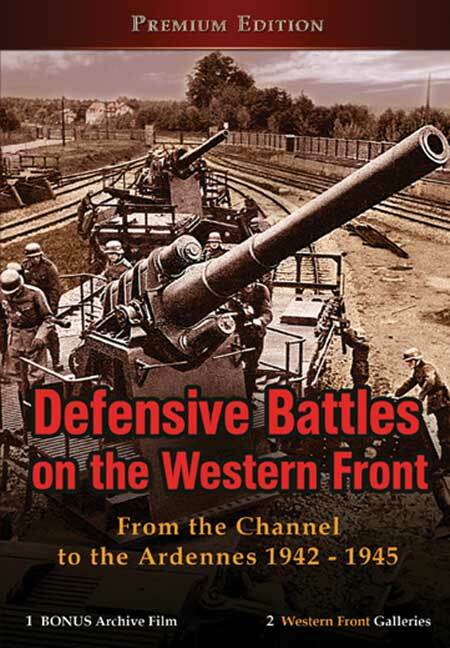 You'll be £16.99 closer to your next £10.00 credit when you purchase Defensive Battles on the Western Front. What's this? On 13 February 1942, Operation Cerberus, also called the “Channel Dash”, was a major naval engagement during the Second World War. Consisting of the large battleships Scharnhorst, Gneisenau, and Prinz Eugen, as well as a number of smaller ships, this fleet ran a British blockade and successfully sailed from Brest in Brittany to their home bases in Germany via the English Channel. This DVD begins by documenting this spectacular operation by the German Kriegsmarine in a superb example of German planning and foresight. The DVD then switches to the Dieppe Raid which took place seven months later on 19 August 1942 where 6,000 Canadian troops, supported by the Royal Navy, attempted to take control of one of Germany's major ports. This tentatively put forward attack took place under the pressure of Stalin, who called for the establishment of a second front in the west. The disc retails at £16.99 and features over 50 minutes of rare and unseen archive footage and includes exclusive bonus films and original photo galleries. Defensive Battles on the Western Front shows the formation of much of the Atlantic Wall using rare and sometimes never seen before footage from German archives. The building of German pill boxes, gun emplacements and tunnels can be seen in detail. Yet another masterpiece from the History Film team. The archive footage in this DVD in unequalled. It must be remembered that the German war machine had many successes during the second world war, many of them on Britain’s doorstep. This DVD helps us understand just how close we came to defeat by a highly trained and tried and tested enemy. The quality is generally good and features footage not seen since WWII. The period covered is that of the period from the development of the Atlantic Wall and the raids leading to the Allied landings in Normandy, continuing to the final surrender of German Forces in 1945. As with other DVDs in the series, there are bonus galleries and archive films. Outstanding footage of all arms of the German war machine in action, grouped under the most broad subject of defensive operations in the west from 1942 to 1945. It begins with the formation of the Atlantic Wall, including detailed film of bunkers, artillery emplacements and fortress systems under construction along the entire coastline of German-occupied Europe. The successful break-through of the straits of Dover by the battleships Scharnhorst, Gneisenau and Prinz Eugen is covered, as is the ill-fated Dieppe Raid of 1942, when Canadian troops were met by an alerted and fully prepared defence. The strength of the Atlantic Wall was not to be properly tested, however, until the Normandy landings in June 1944, when it was swiftly overrun by the Allies. Thereafter, the documentary focuses on a series of defensive actions carried out by the Wehrmacht from France to the German border, culminating in their failed offensive through the Ardennes in December 1944.